In the late 1800s, the Ontario government was eager to establish settlements in an area known as the Clay Belt, which fans out from the north end of Lake Temiskamining. This area of rich farmland was seen as a prime starting point for the settlement of �New Ontario� as northern Ontario was then called. At that time, no one dreamt that silver mining in Cobalt, and gold mining on the northern fringes of the Clay Belt, in Kirkland Lake, and further north in Timmins, would soon become the driving force for settlement, rather than farming. For at that time, many believed that there were no precious metals like gold and silver east of the Rocky Mountains. 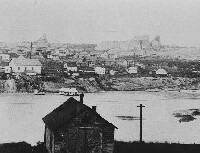 The towns of New Liskeard and Haileybury on Lake Temiskaming were both established in the late 1890's, but at that time the only way to reach the towns was by canoe or by steamer up the lake in the summer. Only a few hundred people lived in the area, but there was a push to build a train line north from North Bay to New Liskeard, to help promote settlement. Initially there was commercial interest in the project, but this faded, and in 1902 the Ontario Government decided to build the line. By the summer of 1903 the line, the Temiskaming and Northern Ontario, was getting close to Haileybury (imagine that happening today � make a decision to proceed, and a year later 100 miles of track are already laid!). Numerous contractors were employed in the construction � �contracting out� is not a new concept. Among the contractors were James McKinley and Ernest Darragh who were supplying ties for the line. In the summer of 1903 they were working north of the Montreal River, ahead of the rail line itself. About five miles south of Haileybury was a boot shaped lake called Long Lake. On a beach along the south shore of the lake McKinley and Darragh found some pebbles which contained some metal flakes. They had no idea what the metal was, but bit it, using the old prospectors test for gold. Tooth marks in the metal were encouraging, though, as it turned out, they had bit into the other minerals with the silver � silver is too hard to bite into. It did not occur to them that the metal could be silver, since silver in exposed veins is dull black with tarnish, and did not attract the eye of the early prospectors. On August 15, 1903 McKinley and Darragh staked a claim, and later sent a few samples to an assayer in Montreal for chemical analysis. The initial results were not promising � since McKinley and Darragh did not know what they were looking for, the first samples didn�t have that much silver in them. But more samples sent later in the fall had much better results � the grade, or richness of silver content in the rock, was measured to be 4,000 ounces of silver per ton, or about 12% silver. At that time, silver was worth about 50 cents an ounce, so at that grade, just 1 ton of rock contained about $2,000 worth of silver. That was a lot of money at a time when salaries for most workers were little more than a dollar a day. 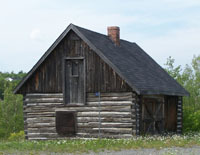 In the meantime, Fred Larose, a blacksmith working on the railway, had a small cabin at the north end of the lake, near the Mile 103 post of the line. Larose had noticed cobalt bloom on the rocks in the area. To quote Larose "One evening I found a float, a piece as big as my hand, with little sharp points all over it. I say nothing but come back and the next night I take pick and look for the vein. The second evening I found it." Like McKinley and Darragh, Larose had no idea what the metal was � he thought it might be copper � but he was smart enough to recognize that there was something of value in the rock, and staked a claim. A short time later Larose was in Mattawa, on his way home to Hull, Quebec. He stopped by a store owned by Noah and Henry Timmins, who were also part time prospectors. Larose showed Noah the sample � Henry was in Montreal at the time. Noah too did not know what the minerals in the rock were, but he too recognized an opportunity when he saw it. He sent a message to Henry and a few days later Henry was in Hull, and offered Larose $3,500 to purchase half the rights to his claim. After years of fruitless searching, the Timmins brothers had finally entered the mining business. The quick decision to invest in Cobalt paid a handsome reward. In 1905 the Larose Mine shipped its first two carloads of ore, which earned over $50,000. Much more money was made in the years that followed. The Timmins brothers made their mark in Cobalt and Noah later provided capital to help get the Hollinger Mine in Timmins into production. The Hollinger properties went on to produce about 20 million ounces of gold. 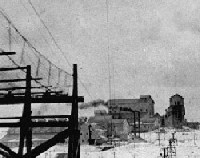 Timmins later provided funding to help build the Horne Smelter in Noranda, Quebec, and also provided development funds for many other mines in Quebec, Ontario, Manitoba and Yellowknife. One of their business partners in these ventures was a lawyer from Mattawa named David Dunlop. Like the Timmins brothers, Dunlop too became very wealthy. He later donated money to the University of Toronto, and today the David Dunlop Observatory at the university is named in his honour. But back to Cobalt. Fred Larose also showed some of his samples to Arthur Ferland, owner of the Matabanick Hotel in Haileybury. Ferland remarked that the rock contained "some kind of damn metal". 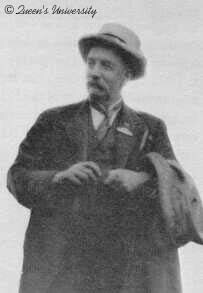 A short time later the Director of the Ontario Bureau of Mines, Thomas W. Gibson, spent a night at the Matabanick. Ferland did not miss the opportunity. He showed the samples to Gibson and they also had a discussion about some rather ambiguous language in the provincial Mining Act. Gibson was very interested in the samples, since they reminded him of some of the early nickel ore from Sudbury. He identified the mineral in the samples as niccolite, a nickel-bearing mineral. Gibson sent the samples to Willet Green Miller, a professor at Queen�s University and Ontario's first Provincial Geologist. With the samples Gibson included a note which stated that "If the deposit is of any considerable size it will be a valuable one on account of the high percentage of nickel which this mineral contains. I think it will be almost worth your while to pay a visit to the locality before navigation closes." In October another railway contractor, Tom Herbert, was working on the east side of Long Lake when he came across a vein. He described what he had found to Arthur Ferland that evening at the Matabanick. Walking the property the next day with Herbert, Ferland recalled his conversation with Gibson about ambiguity in the Mining Act. The Act stated that prospectors could stake claims 40 acres in size. However, a little known loophole in the Act, closed soon after, allowed the staking of 320 acres if a surface showing was discovered. With this information, Ferland spoke to four engineers working on the railway. Herbert sold his share to Ferland for $5,000, and Ferland formed a syndicate with the engineers. On October 21 they staked a claim of 846 acres on the east side of the lake. The great Nipissing Property had been born, dwarfing all others in the camp. At the request of Gibson, Willet Miller arrived in the area in November. Millar had initially been disappointed with the samples sent by Gibson from the Larose vein. While there was niccolite on the surface, the interior of the samples appeared to contain a cobalt-bearing mineral rather than niccolite, and at that time the cobalt was of little value. However, Millar sent the sample for chemical analysis and was very surprised by the results. The sample did contain a small amount of nickel and cobalt and over 65% arsenic, but the sample also contained almost 19% silver. With this information in hand, Millar had made his preparations to go to visit the discovery sites around Long Lake. Millar quickly realized that the veins were rich in silver. Blackened samples rich in tarnished silver had been overlooked by the early prospectors in favour of the samples containing shinier but less valuable minerals such as niccolite. Miller inspected four newly discovered veins, including the vein discovered by Larose, and the Little Silver Vein. At the base of the Larose vein, Millar observed "lumps of weathered ore weighing from 10 to 50 pounds carrying a high percentage of silver". At the base of the Little Silver Vein, which extend up the side of a 60 foot high ridge south east of Long Lake, Millar reported that there were "pieces of native silver as big as stove lids and cannon balls" and that "loose silver is common in immediate proximity to the vein; every depression in the rock on the top of the hill contains much free silver. The earth occupying these depressions is deemed by the owners of sufficient value to sack and ship for treatment". Four samples collected by Miller contained over 23% silver. From his visit Miller concluded that "The ore is undoubtedly very rich, containing values of nickel, cobalt, silver and arsenic, and a comparatively small vein could be worked at a handsome profit". Despite these discoveries, there was no great staking rush in the spring of 1904. Many were convinced that this discovery would fizzle and fade like earlier ones, such as a silver discovery near Fort William in the 1880's in which many investors lost out. Despite the glowing reports of the Provincial Geologist, investors in Ontario were not ready to risk their money on a venture they though would soon fade. However, some prospectors did come to the area, and more ground was staked. One of those who arrived in Cobalt that spring was William Trethewey, who had previously worked as a prospector in British Columbia. On just his second day of prospecting he discovered the vein that was to become the Trethewey Mine. After staking a claim with the help of another prospector, Alex Longwell, he then discovered a second vein. On the advice of the Willet Millar, who was again in the area, the second property was named Coniagas after the chemical symbols of the metals in the rock � Co (cobalt), Ni (nickel), Ag (silver) and As (arsenic). Within days of arriving in Cobalt Tretheway had discovered not one, but two mines. And within a short time Longwell went on to stake the claims that became the Buffalo Mine. One evening in the spring of 1904 while Millar was again in the area, he posted a sign alongside the railway tracks which read, �Cobalt Station T. & N.O. Railway". Within a few days, prospectors registering in hotels in Haileybury were using the name Cobalt. The camp had a name. Soon Long Lake was renamed Cobalt Lake. 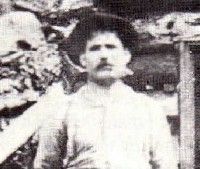 In September of 1904, W.A. Parks of the Geological Survey of Canada visited the area. He reported that "it is a reasonable assumption that other valuable properties will be located as the region is more thoroughly prospected." Thus, by the end of 1904 the future of the area looked bright, and while some of the best ground had already been staked, the prospect of further silver discoveries was good. The stage was set for a rush in the spring of 1905. Word began to spread that the discovery at Cobalt was no hoax, and prospectors and developers began flooding into the area in the spring and summer of 1905. 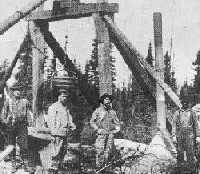 By late 1905 there were sixteen mines in the area employing 438 men and shipping $1,366,000 worth of ore. Permanent though crude buildings replaced the tents of the previous year, and the town became more established, although growth was haphazard and anything but carefully planned. That fall, the first school opened, for many of those who went to Cobalt in search silver brought their families with them. The mines at that time were all very small and most were simple operations. Ore was mined with picks, hammers and drilling bars and hoisted to the surface by hand. Profits were huge; in 1906 $2,000,000 worth of ore was shipped. As the richest surface veins were exhausted, the exploration for new veins intensified and existing mines started to go deeper. In 1908, Cobalt supplied nearly 9% of the world's total silver production, an incredible growth in production in just a few years. Since most of the veins in Cobalt were surface veins or near surface veins, the best way to explore for new veins was to expose the rocks at the surface. The main way to do this was to cut down all the trees and then dig trenches in grid like patterns. 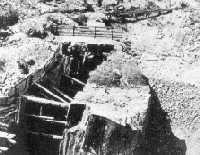 However, prospectors for the Nipissing Mine developed a more effective way of exposing the rock, to the detriment of Cobalt Lake and Peterson Lake. In 1906 they began using high pressure water, pumped from Peterson Lake at a rate of 1,800 gallons a minute, to wash the rocks clean and expose the veins. 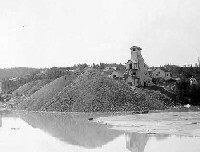 The following account of the effect of this operation on Cobalt Lake was written in 1913: "Formerly the water used to be tolerably clear; now it is tainted or yellow green, and is opaque, due largely or wholly to the powerful water hydrant of the Nipissing Mine clearing away the earth and clay from the surface of Nip Hill...Moreover, there is a portion of the south end of the Lake now being rapidly filled up by the slimes or tailings from the mills." Many of the veins which occurred on land were known to pass into the beds of the local lakes. Some mines extended workings under the lakes to remove this ore. In 1913 a decision was made to drain Cobalt Lake and work deposits under the lake bed. This decision was controversial because some residents feared that draining the lake would lead to the outbreak of disease, but a local doctor refuted this: "Were there not fish in the lake and did not gulls eat them without ill effect," he argued. He reminded [residents] "that the waters were a gift of nature, but since they were now so polluted there was no real drawback to draining the lake". Kerr Lake, to the east, was also drained and "at one period when most of the clear water had been pumped away, some embarrassment was caused by the large number of fish which had been smothered by the mud and came to the surface. Great numbers ranging in size from small perch to eels and pike 30 inches long lay everywhere, and even clogged the suctions and entering valves". 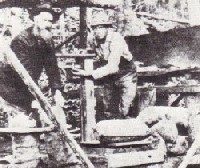 Mining in Cobalt reached its peak in 1911. By this time the town was thriving and had a population of between 10,000 and 15,000. In 1911 production reached 31,507,791 oz of silver, an all time high for the area. The first two years of World War I were hard times in Cobalt. Many of the men were overseas in the war, leaving a smaller labour force to work the mines. In 1916 the price of silver went up, so all of the mines that could find men stayed open. By 1917, labour shortages forced many mines to stop their mining operations. However, improvements in methods to recover silver from the mined rock meant that rock in many of the older waste rock piles could be processed to recover silver. 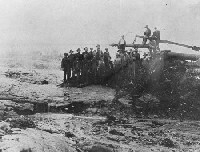 As a result, miners were put to work recovering waste rock for processing. Despite the lack of workers, the mills continued to operate, the silver production continued. By the end of the war Cobalt had reached a milestone with the shipment of 10,000 tons of pure silver. However, the camp was entering its twilight. The postwar population was only about 7,000 thousand, and 1919 was marked by a long bitter strike. The highlight of 1919 was a Royal visit by Edward the Prince of Wales. He summed up the town aptly when he called it "A grey wee town". The 1920's were hard times, with few mines surviving the decade. The Beaver Mine closed in 1920, the railway ripped up several miles of spur track in 1924. The Larose Mine closed in 1930 and by 1932 only the Nipissing Mine and a few minor producers were left on operation. As the big mines shut down, many small companies operated through the 1920s and on into the Depression, scavenging what silver they could find from the closed out mines. In 1934, the Nipssing Low Grade Mill on the east side of Cobalt Lake, burned down. A Cobalt landmark had been lost. In that same year, a cave-in occurred in the south end of Cobalt Lake as a result of mine workings coming too close to the lake bed. This cave-in resulted in as much as 300,000 tons of tailings flooding into the mine workings and bring those activities to an end. 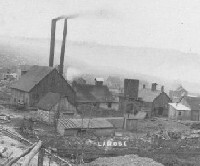 World War II and the period following saw a revitalization of mining in Cobalt. Until then, there had been little use for the cobalt contained in the ores, and most of it ended up in the tailings, but during and after the war new medical uses were developed for cobalt for the treatment of cancer, and the metal also saw increasing use in metal alloys. In addition, the discovery of new high grade veins led to renewed exploration and mining for silver. 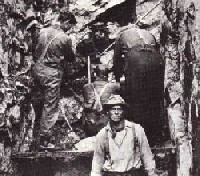 Late in the war, Harry Miller�s Silver Miller Mines found high grade silver at Brady Lake, southeast of Kerr Lake. By the early 1950s, Silver Miller Mines had three operations at Brady Lake, the Lawson Mine, and the Larose Mine. 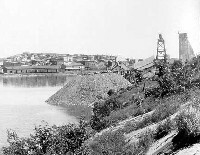 Other mines reopened too, including the Right-of-Way, Crown Reserve, Kerr Lake, O�Brien and Nipissing. Other properties that reopened included the Savage Mine (Silver Summit, Silverfields), and the Bailey property (Glen Lake Silver). For a while the glory days of Cobalt returned. Some operations also scoured old waste rock piles, looking for cobalt that has been discarded by the early mines. And some operations also re-processed tailings for their silver and cobalt content. Tailings from the south end of Cobalt Lake, for example, were re-processed and then re-deposited in the north end of the lake. Interestingly, while mining in other camps across Ontario had changed drastically since the turn of the century, time seemed to stand still in Cobalt. The large drills and machines being used increasingly in other mines were not suited to mining the narrow veins of Cobalt. 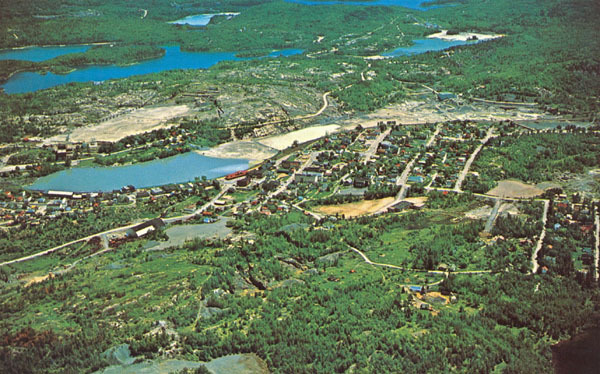 In the early 1980s though, at least one operation, the Silversides Mine in North Cobalt, did introduce newer method, using a decline or ramp from the surface, rather than a shaft and headframe. Using the ramp trucks and other equipment were able to drive into the mine. The author had an opportunity to go underground at this mine in 1986, shortly before it ceased operations. Inevitably, the ore was depleted, and by the 1970's most of the mines had again shut down. The Silverfields Mine at Cart Lake operated until 1983, and Agnico Eagle and a few smaller companies continued to work at other properties in the area until the mid 1980's. A couple of short lived ventures kept hopes alive through the 1990s, but today the mines of Cobalt are silent. Today, only one operation remains, recovering metals from recycled materials at a milling facility on Giroux Lake. But Cobalt has closed before only to be revitalized later, and many in the area still hope that mining will again drive the town�s economy. Rising commodity prices and increasing exploration for silver, base metals and even diamonds may lead to mining again in the future.